The weather here in the Triangle area has been crazy with freezing rain followed by 73 degrees and sunshine one day later. I took advantage of the recent Spring-like conditions to revisit my newest site. This campground has never been hunted and finds were steady throughout the day. 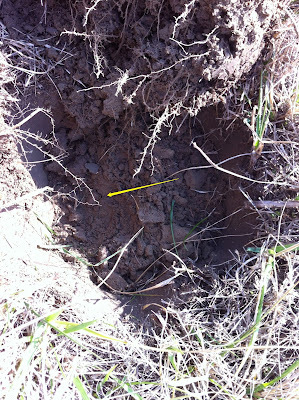 Although the site is practically untouched since the Civil War, conditions are not the best for detecting as tall grass makes it easy to miss good targets, all of which are 8" or more deep. In a recent blog post I wrote about the history of the Williams Bullet and how Sherman's army scorned the Type III variant. 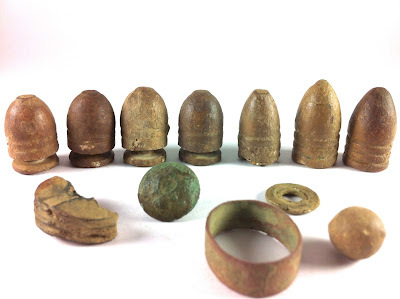 In keeping with that history, most of the bullets I recovered were discarded (un-fired) Type III Williams bullets. They're by far the most numerous find at this site. Here's how one looks in the hole. I log all relic locations with a GPS and it's been fascinating to observe how concentrations of Type III bullets delineate the Federal camp boundaries. Additional recoveries for the day included an Eagle "I" cuff button, knapsack rivet, dropped Spencer bullet, .44 roundball, two standard .58 caliber "three ringers," a small brass or copper ring, and a piece of brass with threading on its edges that may be part of an artillery shell fuse. I'll have to do some more research before I can say for sure.